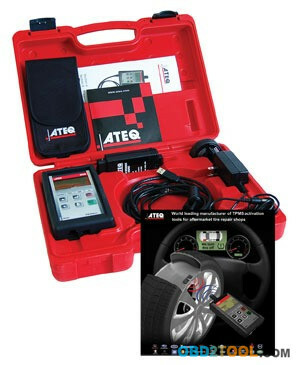 The TPMS Tool Kit from ATEQ Corp. consists of VT-55, an OBDII Programmer, charger, software and is now available in a red carrying case. The TPMS Tool Kit from ATEQ Corp. consists of VT-55, an OBDII Programmer, charger, software and is now available in a red carrying case. This tool triggers all import and domestic vehicles in just seconds.The kit currently writes to Honda, Toyota, Subaru, Hyundai, Kia and Nissan ECUs. The ATEQ VT55 OBDII TPMS Kit displays and stores up to five sensors, and allows information to be printed. The device resets the TPMS light within three minutes. ● Diagnose TPM sensor functionality. ●Turn the TPMS light off within just a few minutes. ●Display sensor ID, pressure, temperature, battery status. ●Ability to write sensor information to vehicle ECU on Toyota, Lexus, Hyundai, Kia, Honda, Acura, Subaru and Mitsubishi; more makes to come soon. Worldwide supplier of ATEQ TPMS tools and equipment to OEM customers, which lead to the design and manufacturing of a universal TPMS tool for the aftermarket technician. Distributors and end users are getting a reliable tool at affordable pricing. ● Small handheld size, made of plastic. ● USB port for printing and updating. ● Standard off the shelf cables for USB and OBDII module. Very easy tool to use: Simply select vehicle make on the large easy-to-read display and turn the TPMS light off within just a few minutes. Toll-free customer support hotline. Serving the automotive industry for over 30 years.